1. 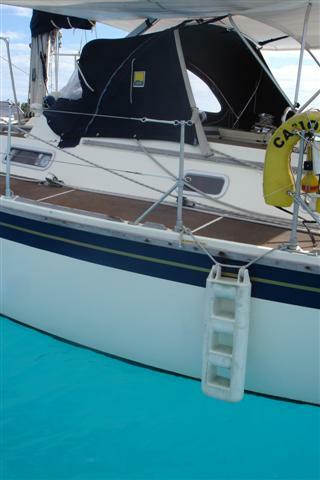 Needs to be low to make for very easy access from the dinghy and the water. In the early days this was really important to Sue as she used to be nervous about her stability in the dinghy. This is no longer an issue however we still often have guests who get off our boat with a lot less personal stability than when they arrived! 2. 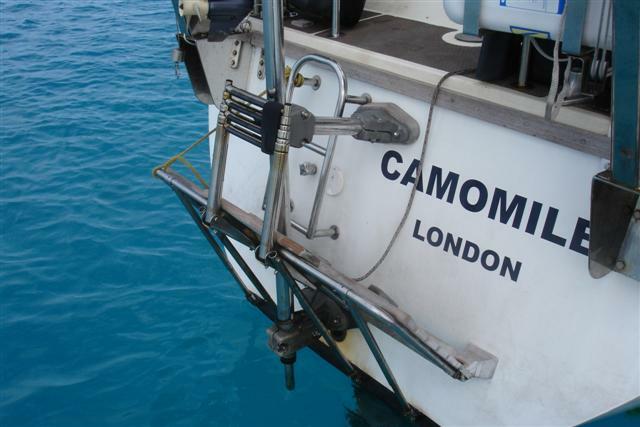 It should be able to flip up so that in choppy conditions the dinghy can be held alongside it without risk of its tubes being trapped underneath the platform. 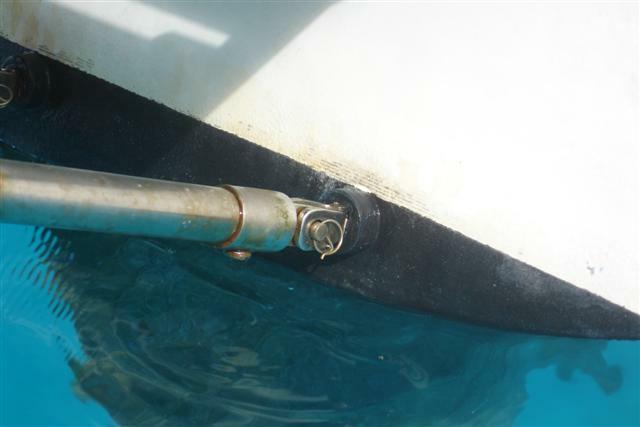 I have seen a number of dinghies completely ruined in this way and the opportunities for hurting yourself in the process would be obvious to anyone who has ever got any part of themselves trapped between moving boats. 4. 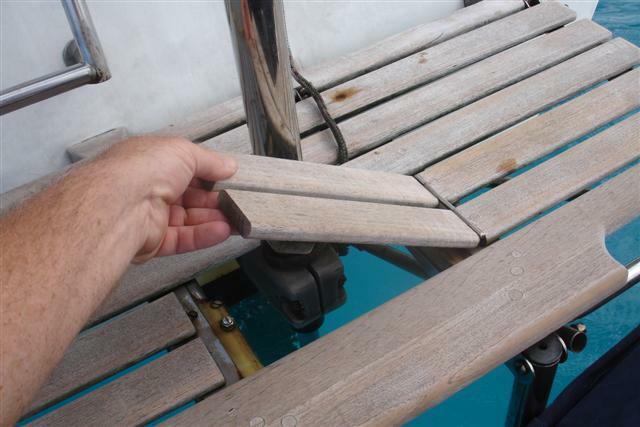 The Hydrovane wind steering rudder must be made accessible without dropping the dinghy or getting into the water so that it can be removed after passages to prevent weed growth and to “rest” it from constant use, flopping back and forth at anchor and jiggling in the propwash while motoring. 5. It should be big enough to accommodate 2 people or 1 person and gear being loaded. 6. 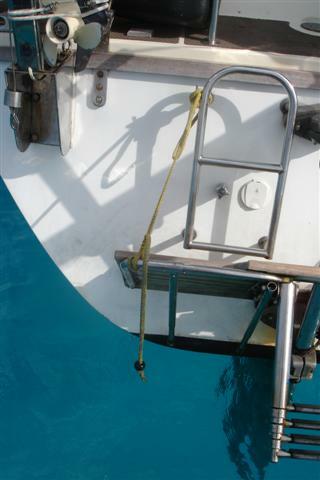 It should have an easy grab rail to hold onto when alongside in the dinghy or when getting out of the water. When I had started to get a reasonable idea of what I wanted to build, I got some simple drawings together to gather a rough idea of the cost. Even though I have had many stainless parts made before I still got a shock when the costs came in. This meant a re-think but I really wanted to find a way to drive the costs down rather than remove features from the design. Eventually I came across Baseline Marine, a UK company, who stocked a superb range of all the stainless components I needed but provided them as off the shelf series parts rather than as bespoke items. I felt, since we were going to spend years, full time living aboard on anchor that this project was worth spending some time getting right as I was sure I would get good mileage out of it. Designing in the ability to flip up or retract, while adding a complexity, also had the benefit of being able to keep the platform low and wide because, in the retracted position, it would not become immersed underway as the wake and heel moved the waterline up the transom. 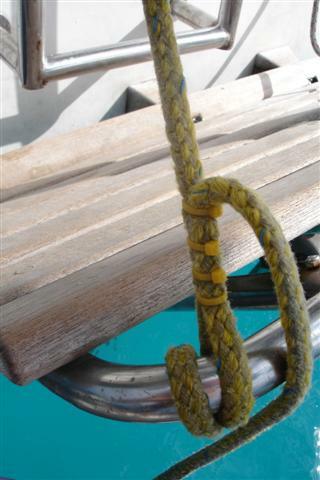 original Westerly ladder served this purpose readily and also provided a cleat to secure the hoisting lanyard. 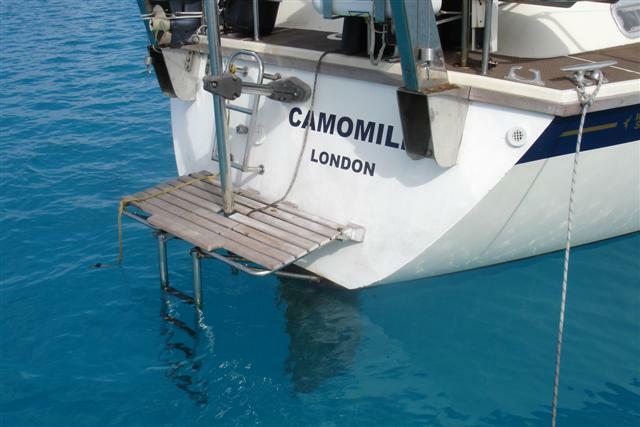 Since fitting the platform in the UK the only change I have made in that area is to add a freshwater hose with a shower head to rinse the salt off after a swim or clean up dirty feet/shoes after a shore expedition. This incidentally is cold water only on the basis that it kept the plumbing simple and with seawater at 25C and 30C air temp in the shade, a hot shower is rarely called for! Finally it is worth mentioning that, while we use the transom 99.9% of the time and it is one of our favorite spots for a sundowner while cooling our feet at the end of a hot day, we also have a fender step for mid-ships boarding when it gets too rough for anything else and that our MOB recovery is an entirely separate and independent system designed for short handed, blue water conditions. 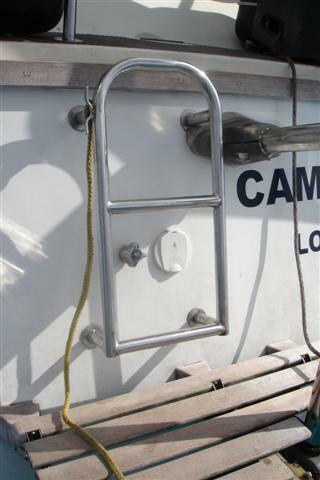 • Length of swim ladder approx 400mm retracted. 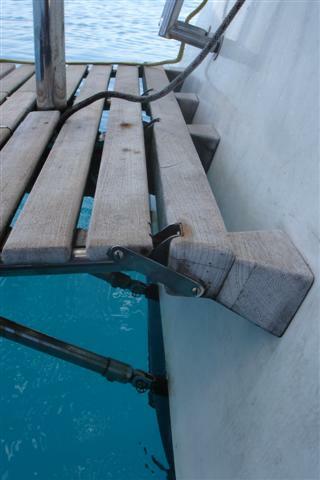 • Length of swim ladder deployed 1100mm with 900mm submerged. this is exactly what i needed to complete my drawings. I look forward to seeing the results Kerry. Good luck with it.